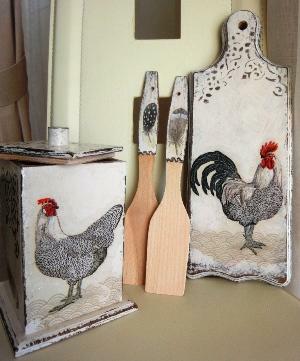 new handy & stylish handmade kitchen set. made of beech wood. cutting board, flour/sugar box, 2 wooden paddles. decorated with country-style hen & cockerel. inside - pure wood. Absolutely practical & healthy use. 100% new, handmade. all materials are non-toxic, eco-friendy & safe. this is an example of my creation. check for new offers regularly: ) Individual orders for decoration, furniture renovation & masterclasses available. price is negotiable, especially for frequent buyers: )) .